Affordable housing tenants are renting out units on Airbnb. What's wrong with that? - Archpaper.com Affordable housing tenants are renting out units on Airbnb. What's wrong with that? 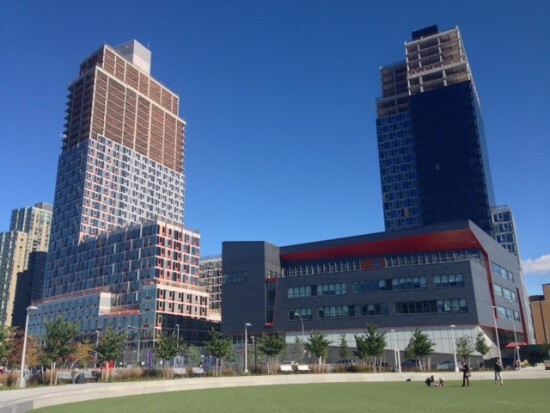 On Tuesday, the LIC Post reported that some residents who received units through the affordable housing lottery in a (SHoP-designed) Hunters Point South high-rise are renting out their units on Airbnb. Market rate tenants expressed righteous indignation, and poor-shamed their neighbors for “gaming the system.” In New York City, renting out your rented place on Airbnb is illegal, but is it really wrong? A Hunters Point South Commons tenant named Nathalye listed her two bedroom apartment on the site for $50o per night, plus a service and cleaning fee. Two other units in the development’s two buildings were listed for rent, as well. Designated affordable units in the Related Companies development range from $494 to $1,997 for a studio, and $743 to $4,346 for a three-bedroom, depending on household earnings. Proponents of sites like Airbnb claim that the site fills an unmet need for less expensive accommodations in a city where the average hotel room costs $297 per night. Opponents note that Airbnb inflates housing costs in the long run and displaces lower-income residents. A full discussion of ethics and affordability is outside the scope of this short post. But, in a city that’s increasingly unaffordable for all but the very rich, it’s worth asking: are tenants in affordable units so very different from market rate neighbors units or homeowners using Airbnb to make a buck?